Learn through play! 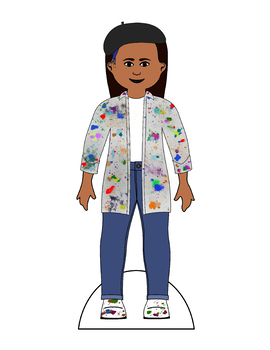 With the When I Grow Up I Want to Be... series, kids can explore different occupations and professions with these artfully detailed paper doll costumes. 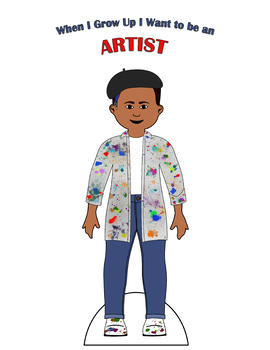 Most costumes are unisex and fit both male and female doll bases. The Artist is hard at work creating beautiful things, and his/her paint-splotched smock bears witness! Underneath the well-worn smock is a white undershirt, tucked cleanly into a pair of skinny blue jeans. A beret sits snugly atop the artist's head, with tell-tale paintbrushes poking out, ready and within the artist's reach. The artist wears a pair of well-worn shoes, also spattered with paint. 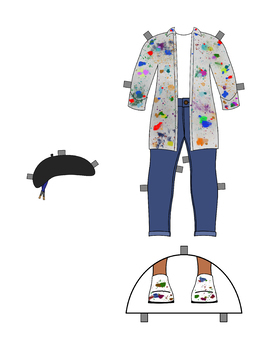 - 1 full-color 3-piece printable Artist outfit. - 1 "medium-dark" skin toned printable female paper doll. 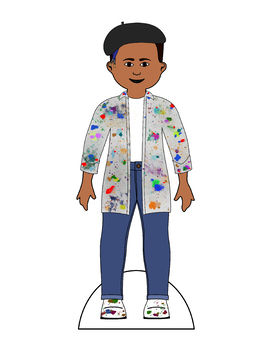 - 1 "medium-dark" skin toned printable male paper doll. Clothing and shoes attach to doll via foldable tabs. More skin toned doll bases are available in our premium doll starter pack.